Aims of the Mathematics Assessment Project? 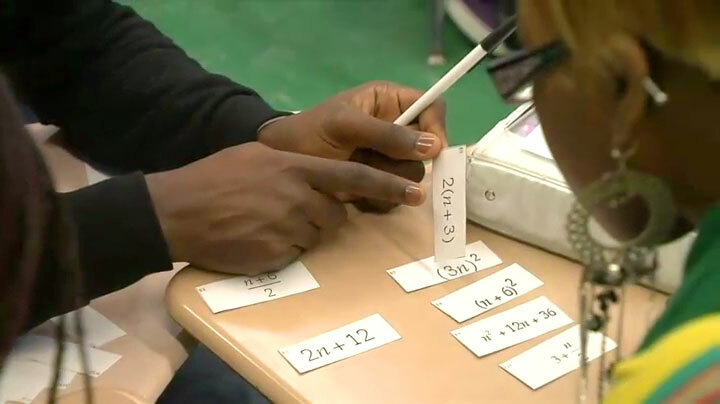 The Mathematics Assessment Project aims to bring the Common Core State Standards (CCSSM) to life in a way that will help teachers and their students turn their aspirations for achieving them into classroom realities. The project materials exemplify CCSSM in explicit down-to-earth performance terms and were produced as part of a collaboration between the University of California, Berkeley and the Shell Center team at the University of Nottingham, with support from the Bill & Melinda Gates Foundation. The team works with the Silicon Valley Mathematics Initiative and school systems across the US and UK to develop improved assessment. Summative tests or tasks exemplify the performance targets that the standards imply. The tests show the kinds of performance that students in rich math programs will achieve, with the range and balance that the standards describe. The tasks, with the associated guidance, equip teachers to monitor overall progress in their students’ mathematics. Classroom Challenges are lessons that support teachers in formative assessment. They both reveal and develop students’ understanding of key mathematical ideas and applications. These lessons enable teachers and students to monitor in more detail their progress towards the targets of the standards. They assay students’ understanding of important concepts and problem solving performance and help teachers and their students to work effectively together to move each student’s mathematical reasoning forward. In addition, because formative assessment involves a wider range of classroom strategies and skills than many traditional curricula, the professional development modules will help teachers with the pedagogical and mathematical challenges that this approach involves. Built around the Classroom Challenges, these modules are designed for use by groups of teachers, working together in a supportive school to improve the effectiveness of their program. These materials have been developed in classrooms across the US, using the research-based design and development methods that the MARS Shell Center team has advanced over the last three decades. We are grateful to the teachers and students who took part in the development process. They, in turn, are helping lead the way toward preparing students across the nation with the knowledge and skills they need to succeed in college and careers. Design and development was led by the MARS Shell Center team at the University of Nottingham. The Classroom Challenges have been designed and developed by Malcolm Swan, Sheila Evans, Nick Clarke, Colin Foster, Marie Joubert and Clare Dawson with Daniel Pead, Hugh Burkhardt and Rita Crust, working with Alan Schoenfeld and Phil Daro at UC Berkeley, and groups of observer-researchers around the USA, led by David Foster and Linda Fisher, Mary Bouck and Diane Schaefer. The design of the summative assessment tasks and tests has been led by Rita Crust, with Hugh Burkhardt, Daniel Pead, Alan Schoenfeld, Malcolm Swan and others. The Mathematics Assessment Project is directed by Hugh Burkhardt, Malcolm Swan, Daniel Pead, Phil Daro and the Principal Investigator, Alan Schoenfeld. MARS, the Mathematics Assessment Resource Service, is an international collaboration dedicated to the improvement of assessment. The development of these materials would not have been possible without the support of the Bill & Melinda Gates Foundation. "Burkhardt and Swan have served as strategic and creative leaders of the Nottingham-based Shell Centre team of developers. Together, they have produced ground-breaking contributions that have had a remarkable influence on the practice of mathematics education.” "Among the many projects they designed and developed the Mathematics Assessment Project, a collaboration between the Shell Centre team and the University of California, Berkeley. Its 100 ‘Classroom Challenges’ which are formative assessment lessons based on diagnostic teaching, have received over 3 million lesson downloads. Through the Math Assessment Project and other projects, Burkhardt and Swan continue to have an extensive impact on mathematics teaching and assessment around the world." Formative “assessment for learning”, when used as part of day- by-day teaching, has proven to be one of the most effective ways of enhancing student learning. This approach is very different from testing; it involves qualitative feedback to develop each student’s reasoning. Equally important, the learning activities in most classrooms closely reflect the range and balance of task types in high-stakes tests, which currently cover only a small part of the range implied by CCSSM – these prototype summative tests are designed to exemplify what is needed. The team uses its well-established engineering research [PDF,100K] methods involving: input from prior research; design skills to produce draft materials; iterative systematic development through trials in US classrooms, with revision informed by structured feedback data from the observer teams. In addition to our own research on the outcomes an impact of the Project, we engaged Inverness Research to provide feedback during the development of the project and to evaluate the impact of our materials on users. The work of Inverness Research Inc. primarily involves the study of reform initiatives taking place at the K-12 grade levels, but also includes higher education and teacher education. Inverness also has a long history of studying informal science education initiatives. Inverness' report is available from their website in the form of a project portfolio, which describes the project from various perspectives, including the experiences of teachers, students and educational leadership. The report also refers to tentative data from a CRESST study suggesting that the Classroom Challenges produced measurable learning gains, equivalent to an additional 4.6 months of schooling.